Especially for people with disabilities, sports diving holds an immense potential for positive influences – both physiologically and psychologically. retainment and development of individual movement functions/motorskills. Wheelchair users can experience a real, unexpected freedom of movement in a new dimension. Diving as a sport also proves to be an underestimated therapy for rehabilitation – up to a measure that conventional kinesiatrics cannot reach. For this group of people – diving is a real Sport of Integration! Foreword: We do offer an extensive programme for interested people. Our instructors are qualified under IDDA (International Disabled Divers Assiciation ) and IAHD (International Association of Divers with Disablities) guidlines/standards. You will be in good hands! Every course will be held on a 1 to 1 basis so the instructor can adapt to the needs of the individual. At this point we are very pleased to introduce a young diving organisation which has dedicated their knowledge and teaching abilities to divers with disabilities. We hope that this information will help you to attain more knowledge concerning our aims and duties. Being a person without disabilities isn’t a merit but a gift, which can be taken away at any time. Being barrier free always originates in the individuals mind. and a variety of speciality-programs. The IAHD Instructors course was developed so that already Qualified Diving Instructors could teach disabled students to dive. Our Instructors have been trained by the IAHD, so you will be in excellent hands! Starting with the Confined Water Diver, which will give you a basic introduction to diving. You will then move on to the Open Water Diver. both courses are run on a one to one basis. These courses will introduce you in the underwater realm, gradually building up your confidence and knowledge! For those already qualified, you can progress with an Advanced Open Water Diver, which will provide you with a well-structured, well-supervised means of gaining additional diving experience. The courses we instruct are as follows. The price indicated is a starting price, this is dependent on the level of disability and how many instructors are required to assist with the course. The IAHD Confined Water Diver Course is your basic introduction to Diving. This provides students with the necessary knowledge and skills required to dive safely in Confined Water. Students are required to complete all sections of the academic and confined water training of an Open Water Diver Course. Certification and added safety measures stated on the students certification card are similar to those on an Open Water Diver. The IAHD Open Water Diver Course is the next step in your diving career and provides students with the neccessary knowledge and skills required to dive safely in an Open water environment. Due to the wide varieties of disabilities that one may encounter when training disabled divers and, as all training is performance based, achievement of all, or part of the required objectives will determine the added safety measures the will be required of the individual. The price of the course includes: Instruction, all equipment, manuals, log book and transport to and from dive sites. The IAHD Advanced Open Water Diver Course provides the novice diver with a well-structured, well-supervised means of gaining more diving experience. To become a AOWD, the individual must complete a minimum of 5 elected dives. Based upon the individuals ability to complete the exercises required for each of the dives will determine the added safety measures that will be stated on his or hers certification card. 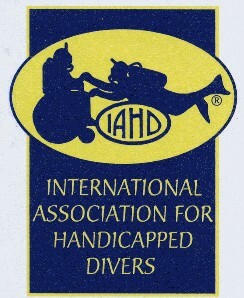 The IAHD Diver Partner Course is designed to train certified divers in how to accompany disabled divers. It is recommenden that trained dive partners who are friends, relatives etc. follow the training course of the disabled individual, whom they later plan to dive with ! The IAHD Surface Support Specialist Course enables a non-diver, family, and friends etc. to become involved in the diving world without actually diving. You will be instructed on how to assemble equipment, Diver First Aid, Transfer and Lift techniques, tracking divers from the surface, equipment disassembly and divers emergency response exercise! Any other courses that you may have questions about, please do not hesitate to contact us. We are sure we will be able to accommodate you !